Woodhead Living’s Michael Broadhurst has successfully completed the Code for Sustainable Homes Assessor Qualification accredited by Building Research Establishment (BRE), a trust set up in 2002 to advance knowledge, innovation and communication for public benefit. The Code for Sustainable Homes (CSH) is an environmental assessment method for rating and certifying the performance of new homes based on BRE Global’s EcoHomes scheme. It is a Government owned national standard intended to encourage continuous improvement in sustainable home building. 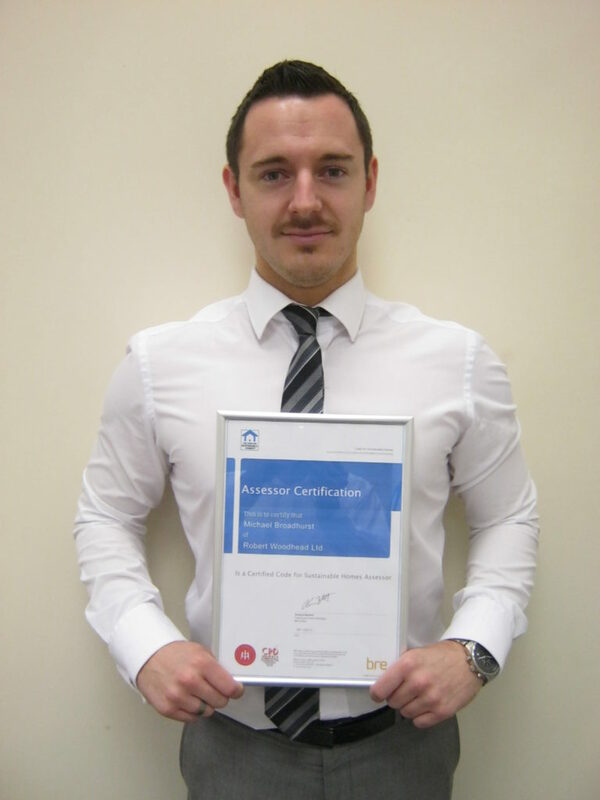 Michael is now a fully certified Code for Sustainable Homes Assessor which means Woodhead Living can offer a 100% in house solution to all Code for Sustainable Homes assessments as well as offering a consultancy service. Woodhead Living is a specialist Sustainable Division of Robert Woodhead, their aim is to build smarter spaces for life. The ability to offer these services in house will provide a better experience for clients in several fields. The benefits for the client includes offering a single point of contact during the project, with a full understanding of the assessment criteria, this will deliver cost savings and a more efficient process of certification. We expect the assessment and certification process to be significantly quicker than using external assessment processes. Since the Code for Sustainable Homes introduction in 2008 there has been a gradual increase in the number of homes achieving post completion certification. In three months to June 2012 there were approximately 11,000 homes awarded with the certification compared to 8,000 in the same period in 2011. The trend indicates the importance of sustainability for future housing developments. Woodhead Living have a proven track record of delivering exemplar Code for Sustainable Homes projects most recently at the Eco Town Development in Gainsborough which saw the scheme achieve Code for Sustainable Homes Level 5. You can see how the scheme achieved such an excellent rating by viewing the 5 minute case study video here.